As eco-friendly gardeners, or as any environmentally concerned citizen, how do we educate, encourage, motivate and influence others, without offending, angering or annoying them? This, of course, is the answer we all want and need, and it is probably the obvious one: The best way to influence others is to think of what it takes for something to influence us. What would it take to get you to change YOUR mind about something? Certainly not criticism or condemnation. What, then? What would encourage you to learn? To change? To begin acting differently? 1) Get rid of the attitude "It's My Way or the Highway" - Extreme environmental opinions are a sure way to turn many people off. 2) Do it for them, not for you – It’s easy to look at someone else’s actions and see how they may be negatively affecting you. But that’s probably not the best attitude to take when trying to influence others. Adopt the attitude that you want to help them learn, NOT that you just want them to stop what they are doing. 3) Make friends with them – Most of us are more readily influenced by friends than by strangers. If you want to influence your neighbors, take the time to get to know them. Knock on their door. Smile. Introduce yourself. Take them some flowers or produce from your garden or some homemade cookies. 4) Find out what motivates them - By getting to know someone, you can determine what it will take to influence them. Talk about nature. Talk about money, family, health or yard work. See which topics spark their interest. Knowing how they feel about these topics will let you know what tack to take in educating them. 5) Adopt the “We’re in this together” attitude – Don’t assume the role of educator . No matter how much you think you know about eco-friendly gardening, you probably don’t know everything. Take the approach of learning with them, not teaching them. 7) Compliment them – Take a look around their yard and pick out some of the best features. Compliment them on the aspects you see that are eco-friendly. Do you see butterflies? Is there mulch in the garden? Are there permeable paths? They may be helping the environment and not even be aware of it. Teach them by complimenting the benefits of what they are already doing. 8) Keep your own yard looking nice – One of the best ways to influence others is by example. And as green gardeners, one of the best examples we can set is to keep our own yards tidy. In an article, Why Visual Appeal Matters , which I found on a Sierra Club website, writer Arvind Kumar says this: “your garden influences people every time someone walks by or drives by. People form impressions and opinions based on what they see; they are much more likely to emulate you if their impression is favorable”. 9) Show and tell – Invite them to your yard. Show them the things that you have already learned about eco-friendly gardening. Show them how beautiful native plants can be. Explain how your rain barrel works. Show them the caterpillars munching away in your garden and explain to them that they will soon be beautiful butterflies which help pollinate the flowers. 10) Make it about people , not about the planet - Studies show that people are more willing to make the right environmental choices if they understand the benefits to people, instead of the planet. Share what you have learned about the personal, physical dangers of pesticides or herbicides rather than more abstract ideas such as global warming. 11) Share the green goods– Nothing tastes better than fresh, home grown food. If you grow your own fruits, vegetables or herbs, share them with your neighbors or bake them into scrumptious snacks to share. If you have some extra insecticidal soap or other eco-friendly products, offer to share them. Or share your recipes for home-made products. If you have a rooted cutting or seedlings of a native plant, share it with them. Explain the benefits. If you are going to pick up a load of free compost, offer to share it with them, too. 12) Get their kids involved – Your neighbors may not be excited by your earthworms , hummingbirds and butterflies, but their kids probably will be. Converting the kids is often the best way to convert the parents. 13) Challenge them – Friendly competition is a great motivator. Once they start their “green” gardening, make it a competition. Take our Eco-Friendly Landscape Quiz together and compare scores. Participate in critter counts or other Citizen Science programs together. See who can attract the most birds and butterflies or who can achieve all of the steps necessary to get their yard recognized in a certification program such as the NWF Certified Wildlife Habitat Program. 14) Offer to lend a hand – You may have already learned the steps to install a rain barrel or start a compost pile. Offer to help your neighbor with theirs. 15) Show them the money (savings) –Explain how rain barrels can save money. Tell them about some of the local rebate programs or where they can get free mulch in the area. 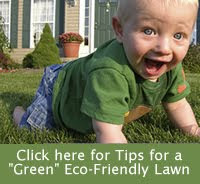 16) Share The Metro DC Lawn and Garden blog and other websites - There is a lot of great information available online. Sharing some of your favorite blogs and websites with them is a great way to help them learn more on their own. Maybe they’ll even learn something that they can teach YOU!